Today was Day 1 with the Lawless America RV. You know those trucks that you see on the highways with two trailers instead of just one? I've always thought how difficult that must be. Well today, I felt kind of like those drivers. I drove a 34-foot RV, pulling a tow dolly about six-feet behind the RV with the 16-foot long Jeep dangling off the back with the rear wheels on the ground. I passed up several gas stations because I didn't think I could make it. Based on the challenge I had with one gas station where I thought it wouldn't be a problem, I'm sure I made the right decision. I visited a lot of gas stations on my 500 miles or so today. I thought there was an omen at the first stop. When the pump shut off, and I grabbed my receipt, I thought "what are the chances that the gas bill was EXACTLY $100." Then I cranked the RV up, and it wasn't full. I came to discover that my credit card always stopped at $100, so I had to be a double-pumper. The gas tank holds 80 gallons, and it is no fun to fill it up. The gas mileage is atrocious pulling the 6,000 pounds behind. All in all, I did okay. 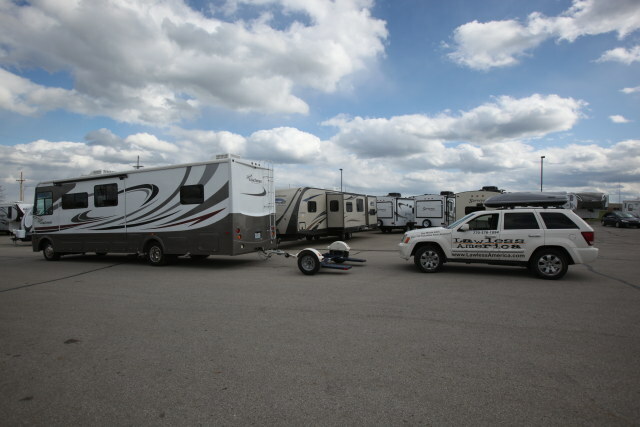 Lawless America obtained this RV in Gardner, Kansas on April 19, 2013 -- a year after the first of several RV's fell through. There was a rock star guy, an attorney-hater author, a guy named Josh who had a mythical RV, a hotelier in Tennessee, and Finally...this one. I planned to begin driving to Georgia on April 19, but the seller didn't have his act together, and I couldn't get the work done on the Jeep so it could be towed. I THOUGHT I learned how to work everything yesterday, but I quickly learned today that there is still a lot to learn. I pulled off the road several times to read parts of the owner's manual. The Coachmen Mirada 32DS is 32-feet long. I guess it's about 8-feet wide, but it has two slide-outs that add about 4' x 10' of space in the living area and the bedroom. We will hang our backdrop at the back of the cockpit area, and place the camera in the middle of the RV near the dinette area. The RV has a 50-amp generator, which will be enough for our equipment. I'm excited about getting it wrapped with dynamic graphics. It is going to be an amazing attention-getter once wrapped. This will make the work much easier. Driving will be harder. Gas will be much more, but I will only use a motel maybe once a week. Chris and Austin at Olathe RV in Gardner, Kansas fixed me up this morning. Austin removed the driveshaft from the Jeep so I could tow it with the tow dolly that came with the RV. Chris and Austin made sure the Jeep was firmly strapped in place, and Austin helped me with a few basics. I left their place about 10:30 am, and I drove until 10 pm tonight. Everything was going peachy until night came, and then I realized that the tow dolly lights were not working properly. There's a single harness, so I found this strange. It's not the bulbs -- just something wacky with the wiring. I put my emergency flashers on until I found a rest stop. Driving the RV is much easier than driving a rental truck; the RV has excellent cameras in the back and on each side. I bought some Mike 'n Ike's at my last gas stop. Now I am holding a crown in my hand, and the Mike 'n Ike's are in the trash. Not cool. I'm too busy to go to the dentist, but I will have to get in Monday. We have several companies working on designs and quotes for the RV wrap. I am not an artist at all, but I know the impact that I want the design to have. The first two to bid are ZDecals.com and Sunrise Signs. Any preference? Please tune in to the Lawless America Show on TalkShoe Sunday, April 21, 2013 at 9 pm Eastern Time. 9-11 pm. We will be discussing the erffort we are making with grand juries in June. if you want justice, this may be your best hope.